Observant readers will notice that the bike above is not a Giant TCR Advanced. Events conspired against the planned test ride this week. 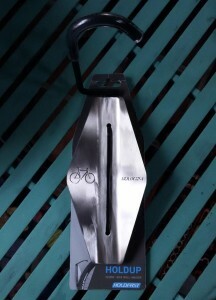 The bike itself turned out to not be available due to a tumble by it’s owner – Daryn. Coincidentally (or maybe not) I woke up feeling pretty crap when the alarm went off and missed the Wednesday ride anyway. So no “possible new bike” review for this week. By another coincidence (or again maybe not) the week ended with a somewhat different absence of TCR, but more on that later. 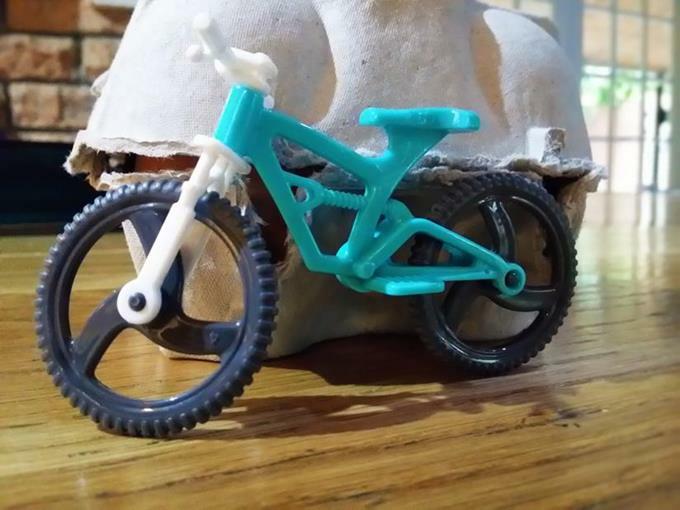 Rather than dwelling on more things not done, let’s quickly cover a couple of productive things I did achieve this week which are sort of cycling related. First up was making good on a promise to Yoli – that I wouldn’t actually buy another bike until I’d made space to store the ones we already have. There’s only so many bikes you can stash around the house before long suffering partners begin to notice. And with two propped up against the dining table, and one behind the couch in the lounge, we’d already reached the end of that particular rope. 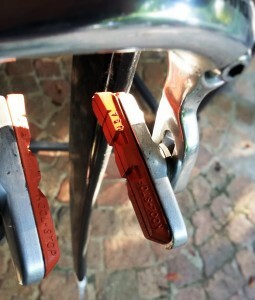 I bought the hooks (Holdfast – a South African brand) for the job some weeks back, but as with many DIY projects they’d sat on a shelf somewhere. In fact, I hadn’t planned to start on the job last weekend either it just kind of happened. We had an hour or so before Ben was due to go watch a friend’s school play, and so Yoli and I set about clearing the shelves and garage space earmarked for them. After I’d taken the junk to the tip, they were still out – so I figured I’d get a bit further and take the shelves down. One thing led to another though, and with the power tools already out, I’d got all but one of the hooks actually mounted by the time they got back. 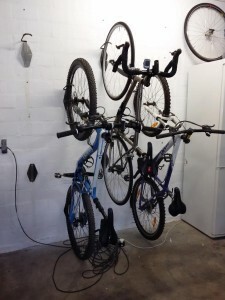 I must say, it was rather a pleasing job – space for four bikes racked up, and room beyond to squeeze an extra hook for Ben’s. I needed to grab an extra hook off William for that, which is still to be mounted, but after seeing Ben’s smile fade when he realised his was not there I just couldn’t leave him out of the party. OK, at this point I’m going to attempt the impossible – make the topic of brake pads interesting … err … nope, can’t do it, so instead I’ll make it quick. Another thing I did this week was finally fit the brake pads I bought a few weeks back. “What’s the big deal?” I hear you ask … what … you didn’t? Well I’m going to tell you anyway. Downhill, fully loaded, on a wet day, the Burls can be scarily lacking in stopping power. I’ve lived with it to the extent I don’t notice it much these days but riding the Propel last week reminded how much confidence decent braking gives you. 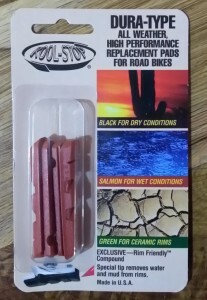 Having been unable to find a long reach caliper that is rated significantly better than my current Shimano BR-650s, I decided maybe a different pad might help. The Kool-Stop Salmons pictured right were reviewed well so I picked up some on my last UK trip and, sure enough, they’ve sat on the side (next to the Holdfast hooks) ever since. Well, not any more. After a few minutes fitting, and considerably more minutes adjusting and re-toeing them in, they’re on and ready to test this week. We’ll find out this week if they’re any good – not often one actually hopes for a rainy day to ride, but at the first sign of a shower I’ll be ripping down our road with glee. And oddly enough, the subject of braking brings me back to that other TCR which didn’t feature in my riding this week – the TransContinental. Details of the 2016 event were announced on Friday, and it’s an enticing prospect – and certainly worthy of the “For Grimpeurs not Grinders” tag line. For the last couple of weeks I’ve had this nagging itch to register for 2016, despite the original plan discussed with Yoli that 2017 would be my target. Needless to say, the idea I’d be aiming at another long distance ride next year was not greeted with immediate enthusiasm (to put it mildly) but, fair play, Yoli did very graciously give me her blessing to enter if I felt strongly enough about it. And in some ways I do. After PBP I’m in good shape both mentally and physically, and the Cape 1,000km next April is an ideally timed practice run at bike kit adjustments. But in other ways, it would be a rushed attempt – next year’s vacation time is fully booked (all 4 weeks) and the work front looks set to be busy too. And that’s really where the organizers made the decision easy for me – that “Grimpeurs” part. Out of curiosity, whilst some TV show was humming along as background noise I doodled a route from CP2 (Furka Pass) to the start of CP3 (Passo san Pellegrino). Ride-With-GPS plotted a fairly direct route, quite short at around 350km, but holy crap the climbing. Surely it had to be wrong – 8,900m – an Everesting attempt in the middle of an already gruelling endurance test. I doodled a bit more, but geography is inevitable – you can’t just ride around The Alps because you don’t want to climb another mountain. Not one option I found came out under 8,000m, and that was near double the distance. At this point we need to look a tad wider too. Leading up to Furka Pass you need to climb from Grindlewald over Grosse Scheidegg, and then tackle Grimsel Pass before you reach the Furka. That’s maybe another couple of thousand meters before you start the section above. My memory of that part of Switzerland is a little sketchy, but I also don’t remember too many flat routes to get to Grindlewald from France either. Then, after Passo san Pellegrino, you still have to reach CP3 atop Passo Giau, and then head on towards Montenegro (the land of black mountains) for yet more climbing to CP4. I’ll stop here because, reluctantly, I knew the answer already. Despite the wonderful mountain scenery which all that climbing would reveal, there is simply no way a “rushed attempt” would cut it. 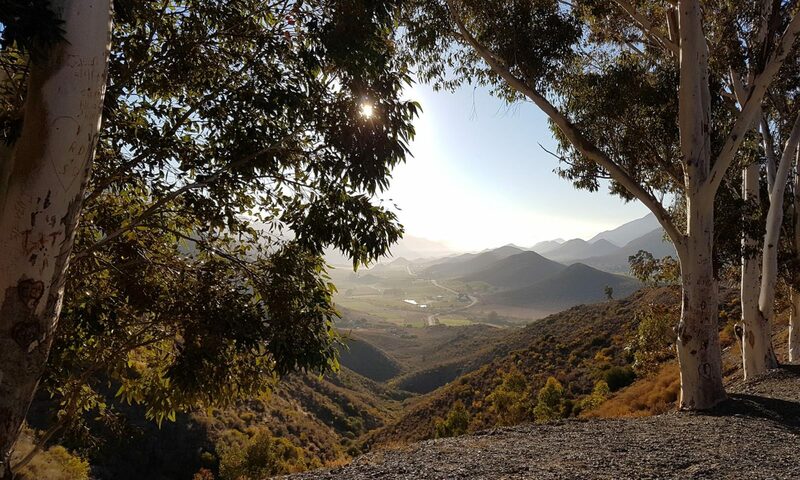 A flatter or rolling route might cut some leeway to wing it and get fitter as you go along – but without proper preparation those mountains would be a punishing lesson and a swift ticket home. Or worse. Chatting to MarcusJB on YACF as I was playing with routes, he also raised the very valid point of weather. Another harsh reality – riding long into the night battling some grueling pass, only to be rewarded with a steep and fast descent in the dark, quite possibly in the rain. And here of course we come full circle back to the topic of less than perfect brakes. A couple of passes and scary descents is one thing, but day after day with growing fatigue and tiring hands, battling to stay on schedule, the dice become rather too heavily loaded on the risky side. It was hard to admit, but a week which started with no TCR ended that way too. The 2016 edition is just too soon and too tough. Anyone who takes it on is very brave, and anyone who finishes it will truly be able to call themselves an endurance cyclist. I have a funny feeling the DNF rate for this edition could rise above the 50% mark typical at the tougher end of long distance events. But 2017 – that’s a whole different chapter. I am sure the challenge will not look even a tiny bit easier, but mentally and physically I’ll have more time to rise to it. And how are those brake pads? 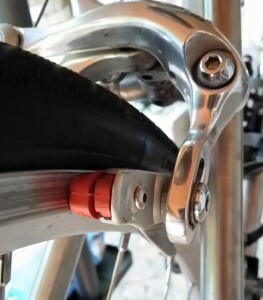 The RLT brakes will be the same as on Peter’s Diverge – TRP Spyre. He seems very pleased with them so far – a bit more pressure needed for mechanical discs over hydraulic, but still plenty of stopping power. Nice thing on the Spyre is they are self-centering, and take standard Shimano pads, so they should be replaceable in the field if needed, and possible to source en-route if you use up your spares. Did wonder about hyrdaulic, but not sure the extra stopping power is worth the risk of not being able to fix them on a tour, whereas a cable is easy to carry and replace. Yep – I do over analyze and over plan!